Warner Bros. made critics sign a nondisclosure agreement prohibiting them from revealing much of anything about the story of this long-awaited Blade Runner sequel; somehow I managed to escape the press preview without signing, but I can't be bothered with the story anyway because it's the same man-versus-machine wankery as in the original. 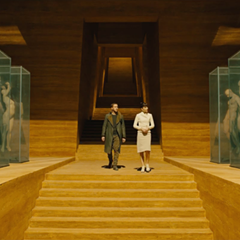 The big attraction of Blade Runner was always the oppressive shittiness of its setting, a futuristic Los Angeles where humanity goes to die, and in 2049, three decades after the action of the first movie, the city is even more densely overbuilt and inhabited, aerial shots showing a veritable mushroom patch of construction. Director Denis Villeneuve, who earned his sci-fi bona fides with Arrival, successfully replicates the cold austerity Ridley Scott brought to Blade Runner. With Ryan Gosling, Harrison Ford, Robin Wright, and Jared Leto. 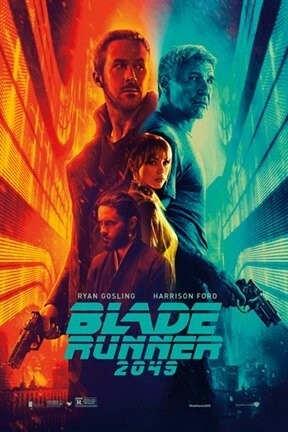 Blade Runner 2049 and Blade Runner 2049 3D are not showing in any theaters in the area.